Ian of The Blog With No Name runs a Secret Santa program every year for the miniatures painting blogosphere, and this year I got in on the fun. I Santa'd for Koen at Ramblings of an insane mind, and after some delay due to back-orders, received my gift from Thomas, whose blog I don't think I know. 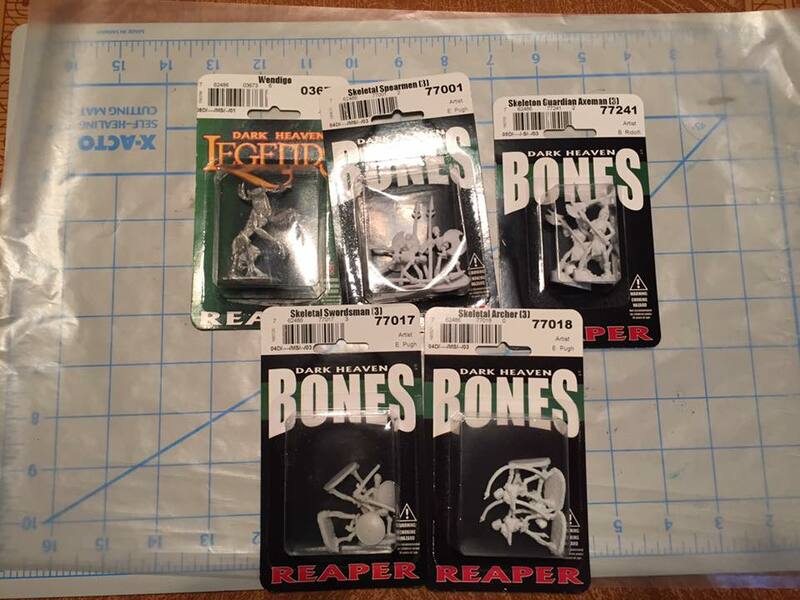 Thomas sent me four packs of Reaper Bones skeletons - one each of three spearmen, archers, swordsmen, and axe-wielding guardians. As if a dozen bone-rattling undead wasn't enough, Thomas went the extra mile and threw in a Wendigo, a creature perhaps tied with Manticores as my favorite mythological monster. Glad you liked the stuff Santa sent you. I'd like to send a special thank you to The War Store who went the extra mile helping me pick out a replacement for the pack that was unavailable. A fine company indeed. A pleasure to make your acquaintance Thomas! I agree, the War Store is wonderful - I've done business with them for several years now and have never had a complaint.